BRISTOL SHOW: Chord Electronics Indigo – the ultimate iPod dock? | What Hi-Fi? BRISTOL SHOW: Chord Electronics Indigo – the ultimate iPod dock? To call the Chord Indigo an iPod dock would be doing it a massive disservice.This highly sophisticated piece of engineering is designed to be the "universal control centre" for all you digital and analogue sources. 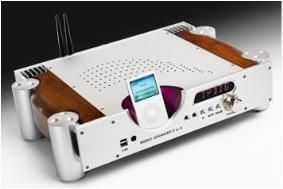 Digital inputs include SPDIF, AES, optical, USB, iPod and Bluetooth. And beneath the hood you'll find a fifth-generation Pulse Array DAC. But what makes the Indigo really clever is that it offers wireless connectivity of your iPod and the ability to stream audio from any A2DP Bluetooth-equipped device such as a mobile phone. And this being Chord, it's no ordinary wireless iPod connectivity we're talking about here. Oh no. Chord will supply you with a modified iPod Classic equipped with its own special dongle so "a true digital output can be obtained to feed directly into the DAC circuitry". Provided uncompressed music files are used, Chord claims this can "at last turn the iPod into a true high-end music source". Cue much gnashing of teeth and heated debate on our Forums. Using the supplied adapter, digital music can be streamed wirelessly via a digital radio link from a modified iPod anywhere in the room. If you don't want to pay for the modified iPod Classic, Chord will supply a standard A2DP dongle for your iPod that links directly to the Indigo's A2DP receiver. In addition, the conventional built-in dock will charge your iPod, and you can transfer and sync music from your PC or laptop to the iPod using the USB connection. An analogue input is provided for non-digital sources via balanced XLR or RCA phone sockets, and there's also a headphone jack on the front panel. So what's the catch? Well, not surprisingly, the Chord Indigo isn't exactly cheap – £8000 to be precise. We can't wait to test it.